Once you’ve taken your Wii U console and all its components out of the box you’ll need to decide where to put the console. It should be placed on a flat surface near your television. By default, the Wii U console lies flat, but if you have a stand, such as the one that comes with the Deluxe set, you can sit it upright. The stand is two plastic pieces that look like something like short “U”s. They go on what is the right side of the console as it is lying flat. The tabs sticking out of the console correspond to slots in the stand pieces. There are three cables that connect to the back of the Wii U. Plug the AC adapter into an electrical socket. Now take ​the other end of the AC adapter, which is coded yellow, and plug it into the yellow port on the back of the Wii U. Orient it correctly by looking at the shape of the port. Take the sensor cable, which is coded red, and plug it into the red port, whose shape will also show you how it goes in (if you have a Wii that you plan to disconnect you can simply connect your Wii sensor bar to your Wii U; it’s the same connector). The Wii U comes with an HDMI cable, which is shaped a little like a smiling mouth. If your TV has an HDMI port, which is shaped the same way, then plug it into the TV and you’re all connected. If your TV is older and does not have an HDMI port, go here. Otherwise, continue to the placement of the sensor bar. The Wii U comes with an HDMI cable, but older TVs may not have an HDMI connector. In that case, you’ll need a multi out cable. If you have a Wii, the cable you used to connect that to the TV can be used with your Wii U. Otherwise you’ll have to buy a cable. If the TV accepts component cables (in which case the back of your TV will have three round video ports, colored red, green, and blue, and two audio ports, colored red and white) then you can use a component cable (compare prices). If you don’t see that, then there are hopefully three A/V ports on your TV which are white, red and yellow. In that case, get a multi-out cable that has those three connectors. If your TV only has a coaxial cable connector then you’ll need that three-connector multi-out cable plus the appropriate RF modulator. Alternately, if you have a VCR it probably has an A/V input and coaxial output you can use. Or you could just buy a new TV. Once you have the appropriate cable, plug the multi-out connector into the Wii U and plug the other connectors into your TV. The sensor bar can be placed either on top of your TV or right below the screen. It should be centered with the middle of the screen. Remove the plastic film from the two sticky foam pads on the underside of the sensor and gently press the sensor into place. If you put the sensor on the top, make sure the front of it is flush with the front of the TV, so the signal can't be blocked. Personally, I prefer the sensor bar to be on the top of the TV, since it’s less likely to be blocked by low objects like my feet on an ottoman or a child. The gamepad charges through either a gamepad AC adapter or via a cradle (which comes with the Deluxe Set). You can charge the gamepad anywhere that’s near an electrical socket; the best places are either by your console or by where you generally sit, so it’s always at hand. If you are just using the AC adapter, simply plug it into an electrical socket and then plug the other end into the AC adapter port on the top of the gamepad. If you are using the cradle, plug the AC adapter into the bottom of the cradle, then put the cradle on a flat surface. The front of the cradle has a notch that indicates where the home button rests when the gamepad is in place. Note: if your gamepad even runs out of power and you want to keep playing, it is possible to use it while the AC adapter is connected. Press the red power button on the gamepad. 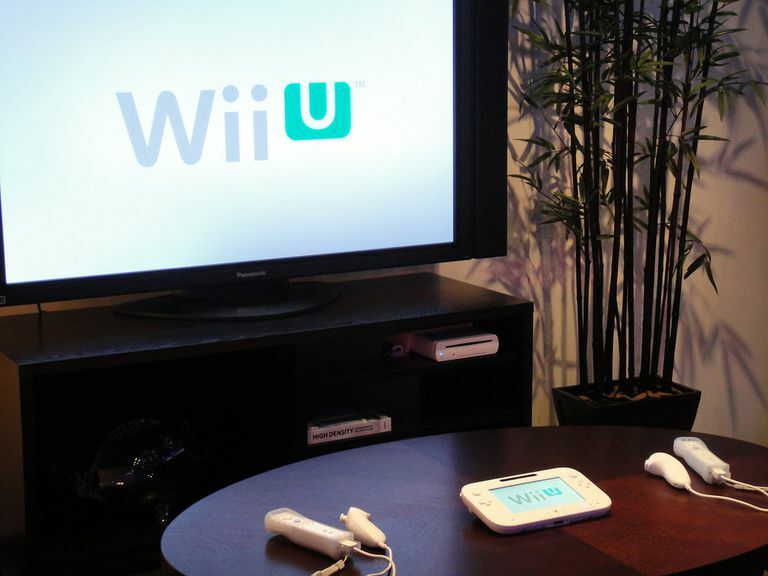 From here, Nintendo will instruct you step by step to get your Wii U up and running. When you are asked to sync your console to your gamepad, you’ll see that the console has a red sync button on the front and the gamepad has a red sync button on the back. The gamepad button is inset, so you’ll need a pen or something to press it. Note that you will also need to sync up any Wii remotes you want to use with the Wii U. You’ll simply use the same sync button on the console and the sync button on the remote, which is inconveniently located under the battery cover. Once you’ve gone through Nintendo’s instructions, and synced up whatever controllers you need, put in a game disk in and start playing games.